A screenshot of two guildies, running god-knows-where. 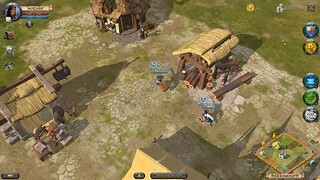 Albion Online ( official site - albiononline.com/en/home ) is new cross-platform sandbox MMORPG with housing, crafting, gathering, PvP... The game is somewhat similar to Ultima Online, and (as I type this, July 2016) in early access, preparing to launch. From their site - "Albion Online is the first truly cross-platform MMO experience, available for Windows, Mac, Linux and Android, with all players on one master server in one massive, sprawling world."